Summary: Kanazawa tackles the nature of intelligence: what it is, what it does, what it is good for (if anything). Highly entertaining, smart (dare we say intelligent? ), and daringly contrarian, The Intelligence Paradox will provide a deeper understanding of what intelligence is, and what it means for us in our lives. Explores how the purpose for which general intelligence evolved—solving evolutionarily novel problems—allows us to explain why intelligent people have the particular values and preferences they have. Challenging common misconceptions about the nature of intelligence, this book offers surprising insights into the cutting-edge of science at the intersection of evolutionary psychology and intelligence research. I listed to this on audiobook which I usually can’t get through but it was so interesting and the audiobook voice was great, I couldn’t stop listening to it. I found this book absolutely fascinating. I must be honest and say that the book isn’t for the light reader or someone who can’t handle heavy explanations of mathematical and science concepts. Some of it was above my head but most of the time I was able to follow along. It was a little back and forth with some of the book seemingly written to academics and some of it written to the average reader. It’s definitely a book you need to give your full attention to. Also I want to point out that the author really knows his stuff. He did heavy amounts of research and shares his sources in the book. He cross references multiple sources and uses mathematical methods to explain statistics. He didn’t just come up with the idea for this book and write it in a few months, you can tell. He must have spent years on research and writing. The author also tells it like it is. He shares what he has learned, even though others will undoubtedly take offense to what he writes. You have to be open minded. Satoshi uses his intelligence paradox (and evolutionary psychology) to show what atheists, liberals, homosexuals, instrumental music lovers, night owls and others are more intelligent. He goes on to explain though that intelligence is NOT the same thing as smart and that in fact, more intelligent people are more likely to do dumb things. Nothing in the book is discriminatory, it’s all based in evolutionary psychological fact. 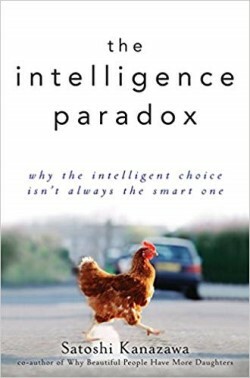 Buy The Intelligence Paradox at Amazon.com and Help Support the Blog.